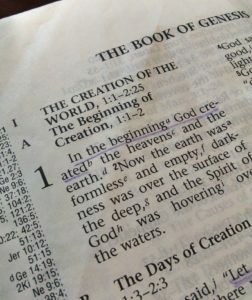 Today we begin with Genesis Chapter 1. Please take the time to read it in its entirety before reading any further. Secondly, we see chaos. Formless, empty darkness is the essence of a nightmare. It stands in sharp contrast to the powerful Spirit of God who is about to change everything. Think just for a moment with me about the chaotic, nightmarish things in your life and remember the mighty God who stands capable of bringing order and beauty to your world. Day by day God begins to unfold an amazing plan of creation. Step by step he systematically creates space for us and calls it good. First He flooded light into the chaos, and separated it from the darkness. Then He separated the waters and placed air safely in between the layers of water. Then He separated the water and let dry land appear. Each phase provided ahead of time for the creatures that would need light to see, darkness to rest, air to breathe, water to drink and land to stand on. Notice there was water above the sky as well. This water protected the atmosphere and created a greenhouse effect allowing things to grow well and long. As we continue in Genesis we will see this water is why man lived so long, but it is also how the flood came to be. After the basics were in place, God began to fill each part in the same order He created them. Going back to the first step of creating light, He now filled both the light and the darkness with the governing lights of the sun, moon and stars. Moving to the next step of creating air between the waters, He now added life to each with birds and fish. Finally, on day six, He added animals and man to the created land. Notice that He gave man and animals only plants to eat in verse 30. At this time, there was no death of any kind. What an amazing place God created especially for us! It gives me a beautiful picture of the world to come! Hope has entered the world before we even came into existence. Our powerful, supreme God is present and He is good, bringing order to chaos. As we conclude our study today, please ponder these questions. I would love for you to get involved with us by posting your answers in the comments below, either on my website or on Facebook, as you prefer. Most importantly, however, is the time you spend prayerfully considering the words of God from Genesis 1 for yourself today. How have you seen God provide for your needs ahead of time? What are some ways to express your thankfulness for his provision? Faith believes God is present and good. Pause and ask God for more faith in your life, and the ability to sense His presence. God has directed my paths in life in directions I had not intended to travel. Each of those times He blessed me with provisions to meet my needs and to complete the task. I am reminded each day to thank Him for providing for me. He gives me beautiful days and friends to share my life with. He has given me a family that I thank Him for daily. I like your illustration of the nightmare, formless empty darkness. If it were not for the light that is to come in the dawn, I would have been left in a nightmare. God provided for me friends to help show me the Light and to not fear the dark, because the dark could be overpowered by even the tiniest of embers. Each ember, represents a gift from God. I thank God for breathing on each of those embers to help me see the nightmare had no power over me. Barb, we can never predict what the future holds for us, that’s for sure! But we serve a God who knows exactly what is coming and provides what we need as we need it. It’s amazing. Thank you for sharing with us! My friend, thank you for the amazing picture of light overpowering the dark. The tiniest amount of light dispels the dark, completely overpowering it. In John 8:12, Jesus says, “”I am the light of the world. Whoever follows me will never walk in darkness, but will have the light of life.” Truly, Jesus has given you life! You no longer have anything to fear. Wow. I’m thanking God with you! After loosing my nephew, God sent a very special person to me. Unfortunately, she knows what it is like to loose people who were very close to you. The things we talked about helped and still does. Thank you God, for Lora and her willingness to share her story. Thank you, Lora for leading in this study. I look forward to studying under your leadership once again! It is indeed amazing that God continues to provide for our family. My husband has been out of work since November and we have been able to continue to pay our bills. I’m truly grateful for His provisions in this time of such uncertainty. Vs. 26. I LOVE that HE said “let US make man in OUR image, OUR likeness” (US – FATHER, SON, HOLY SPIRIT) I soooooo pray to live up to that image and even though I fall short, I have HIS assurance that I am HIS and HE created me and HE loves HIS creations. Know I am going to love this study and journey. Welcome Bea, Lynn and Tonnah! I’m so glad you are here! I love hearing the stories of God’s faithfulness! I want us to stop and pray for Lynn and her husband as they look for a job…..
Father, first, we thank you with all of our hearts for your provision for this precious family. We ask that you would continue to lead them towards a job to meet their needs. Give them wisdom and courage for each day. We also ask that you give them each day their daily bread. We know you are trustworthy, and we will praise your name as we watch your work out your will in their lives! In Jesus name I pray, Amen. Bea, thank you for your input! You are so right! The Father, Son and Holy Spirit were all present at the time of Creation. Job 33:4 says, “The Spirit of God has made me; the breath of the Almighty gives me life.” Colossians 1:15-20 says, “….all things were created by him and for him….” If you read the whole passage, it is clearly talking about Jesus. To address the very first question, I’m learning more and more as I go about life just how often God is providing for my needs ahead of time and it is amazing. The one big one that comes to my mind is through losing Bethany he provided me with you Lora. Honestly, I know God placed you in my life during that time specifically to help me get through a time that truly felt like a nightmare and after that I made a true God given friend. I suppose I can express my thankfulness by listening more to what God has in store for me than what I think I should be doing myself. Oh and being patient while waiting for any answers, that’s a biggy! Thank you everyone for your comments! I’m sorry I was not online over the long weekend. I will always answer your comments, either with a public comment or a private email, or both. It may take a couple of days though across the weekends. I’m learning as I go and I would love your comments/questions/suggestions for change as I prepare to post the second Bible study on Thursday. Theresa, I sure understand what you mean! It’s so hard for me to be patient for God’s response to my prayers! Faith is knowing He is listening AND acting behind the scenes, even if I can’t see what He’s doing right now. Rita, thank you for your help in so many ways in my life. Everyone, please pray for Rita, as she helps me work toward publishing my autobiography! That is an awesome story Timmy!! Thanks for sharing! And welcome to the Bible study group. No need to worry about being behind, or reading backwards. The studies will stay on my website, so you can catch up as you have the time. I thought that studying Genesis was only going to be educational. Surprisingly though, God is using the story of His creation to open my eyes and convict my heart of a very personal struggle. I am quite blown away by this! In 2nd grade when all of my girlfriends had a crush on the handsome 6th grade teacher, I had a crush on the 3rd grade teacher because she was beautiful, caring, and kind. It was then that I knew I was different from everyone else. I didn’t tell anyone that I liked girls instead of boys because I thought I was the only one and that my friends might think I was a freak. Freak or not, it felt natural to me and I accepted that I was created differently. There have times in my life when I comfortably and happily lived a homosexual lifestyle. And there have been times where I continued to live that lifestyle but in secret for fear of losing the people I love who I knew would not accept me anymore if they knew. Most recently though I’ve been wrestling with whether or not I’m living a life that pleases God because this might not be a part of God’s plan for me. There were people in my life who wanted to me go through scripture and find all of the “scary” verses about sexual perversion and how horrible homosexuality is and the horrible things that may happen to me if I continue to life this way. Of course I avoided doing that. Why would I need to avoid reading Genesis though? I assumed that specific issue was probably not even in there and so it should be a safe book to read. However, in reading just the first chapter I discovered that I don’t need to read about homosexuality in the Bible – not now anyway. I wrestle with whether or not living this lifestyle is or can be a part of God’s plan for me. In going back to the very beginning, I’m learning about what God’s “plan” really IS for everyone, including me. With all that being said, while I was reading, the theme throughout for me was that every time God created something, “it was good.” Seven times in one chapter “God saw that it was good.” Verse 27, “So God created people in his own image; God patterned them after himself; male and female he created them.” (NLT) He created male and female and that was good. He didn’t create male and then male or female and then female because that would not be good. If it was good I’m sure it would be in there. Being a single person without children and not having a huge desire to have children, I needed a homosexual conviction to not just be about “multiplying” too. I needed to be able to hear that God created male and then female and that, THAT in and of itself was good. I am sitting at my desk in my office smiling. This is a perfect example of how God answers the questions of our hearts when we read His Words. He really wants us to know and understand the truth. I am reminded of a verse from the Bible. Hebrews 4:12 says “For the word of God is alive and powerful. It is sharper than the sharpest two-edged sword, cutting between soul and spirit, between joint and marrow. It exposes our innermost thoughts and desires.”(NLT) As we read the Scriptures with the desire to know God, He speaks to the thoughts hidden in our souls. That’s what makes it such a powerful book. I’m grateful to hear your story of God’s words to you. Thank you for your vulnerability to share them with us. I hope you will continue with us through these first few chapters of Genesis, and then I pray you will continue to read on your own. God will continue to help you find the truth, and will heal the hurts of your heart in the process. I am so glad you are starting at the beginning…again. i enjoyed reading your summary after reading Ch 1 of Genesis. God has shown me to have faith time and time again. My understanding of what it means to be a Christian as well as my faith grew slowly throughout my life. Though I didn’t realize all of the seeds that were being planted at the time. Now, looking back, I can see that my faith has grown and I live with more confidence in all areas as I slowly learn to trust Him more and more. I thank Him for giving me that! In recent years, I have mostly read Bible stories to and with my daughter. I look forward to digging deeper during this study and hopefully developing a new habit of reading scripture on a daily basis!